hmmmm – what’s that on the dining room table? Success – and I found the Sudafed! My goals were pretty modest this week – I just wanted to accomplish one small organizational task. My vanity. 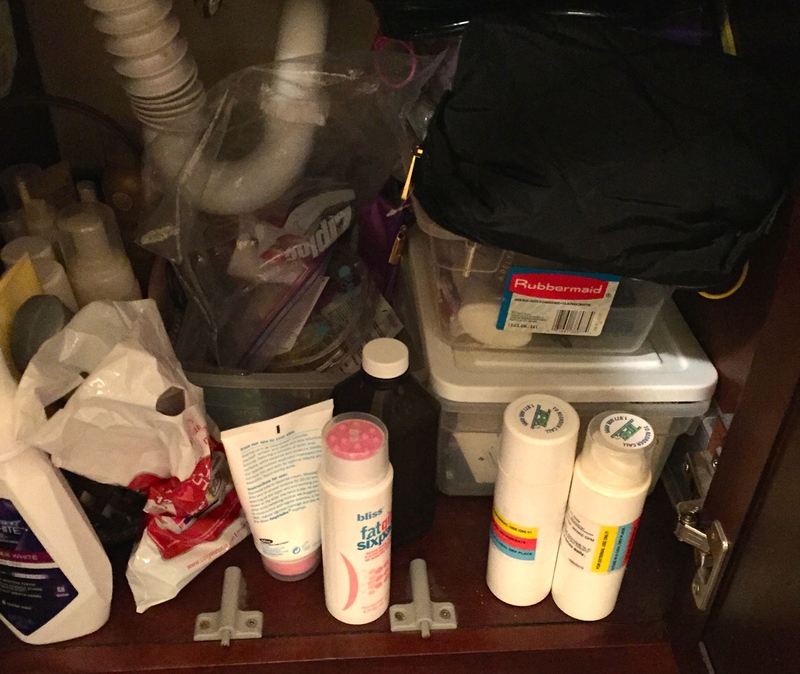 We live in an older house and I have a smallish vanity for my stuff – three drawers and the area under the sink, plus a medicine chest. 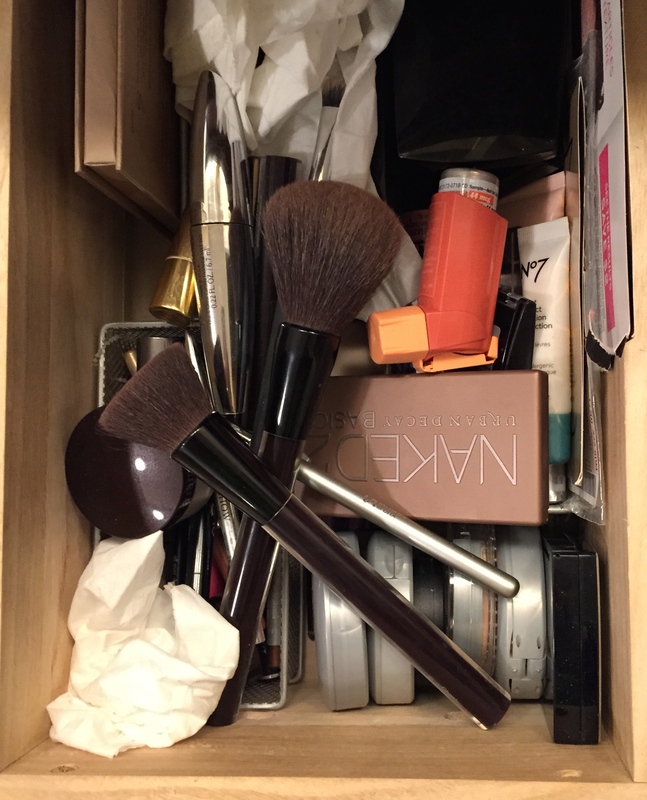 I keep my every-day stuff in this vanity. 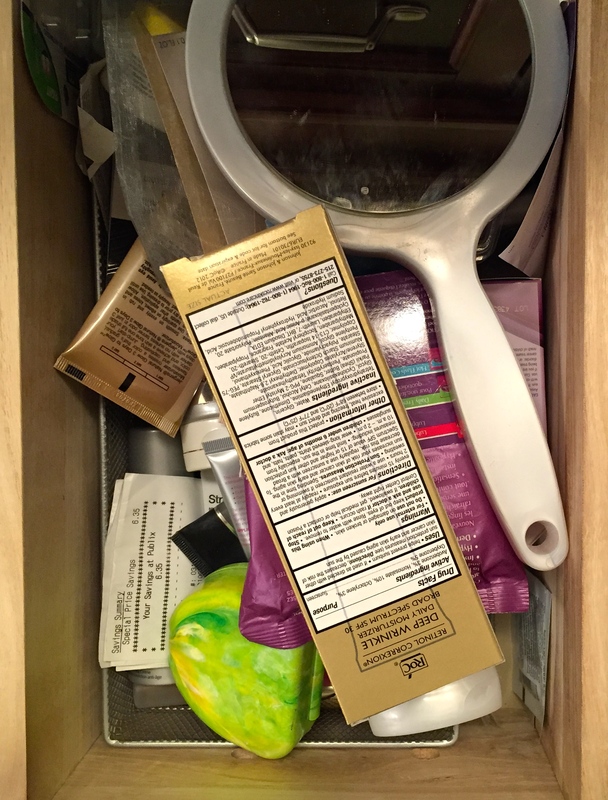 We also have a guest bath with a double sized vanity and a linen closet In that bath I keep all of our OTC medications, Costco sized refills, travel stuff, including those countless free gift bags from Clinique and Lancome. For this week, I just focused on the one room. Monday night I set a timer for an hour and started going through the drawers. Anything that hadn’t been used for a year was thrown in the trash. That included the two Dior eyeshadow palettes (peacock and a variety of purples – and I’m a total neutral girl) that I was talked into by a saleswoman during one of Nordstrom’s makeover weeks. There were loads of partially used products and some foundations and powders that were clearly the wrong colour for me. 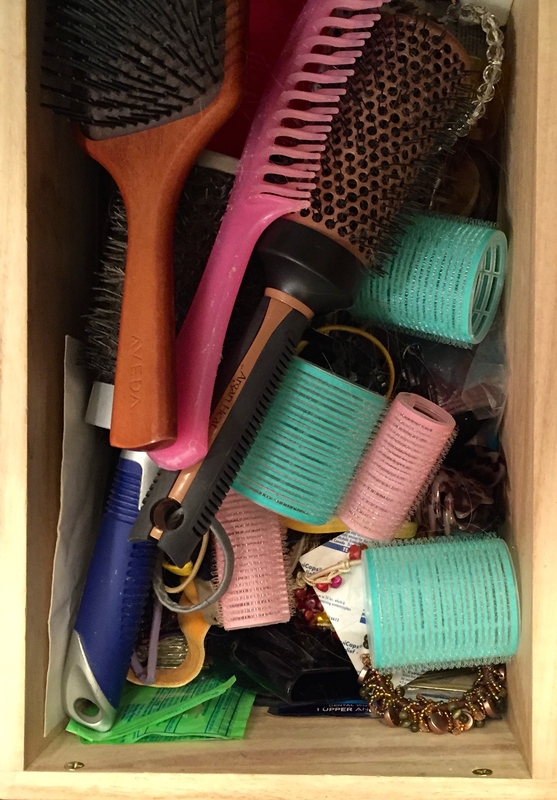 There was also a drawer of hair clips, barrettes, and ponytail holders from when I had long hair. The craziest find was an envelope with a lock of my hair from when I cut it, which was in Louisville in 2002, so I’ve been hauling around that lock of hair for 12 years! Now that I found it, I’ll put it on the bulletin board in my sewing room. Maybe it will be some kind of amulet for organization! The digging and sorting under the sink resulted in a plastic shoebox filled with brand new toothbrushes, floss, paste, proxy brushes and other dental tools. I have a cleaning every 3 months and my hygienists tend to be generous with the graft … apparently I’m not using everything they gives me. I also found three boxes of Sudafed and about 10 boxes of Strepcils (the best sore throat/cough lozenge in the world – and only in Canada or the UK). Seemed like I was constantly buying Sudafed and I was, it was just falling into a black hole! 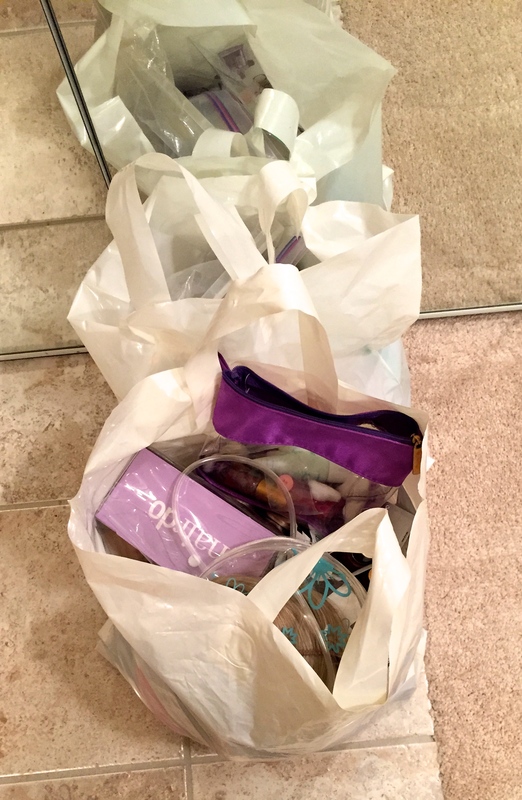 When the timer went off after 60 minutes I had two shopping bags full of makeup, hair accessories, hair extensions, empty medicine boxes, and many bottles of lotions and potions that promised miracles. In all honesty, I did pull out a clip in hair bun that cost me $49 and I’ve never worn it. I just couldn’t give it up. Why did I set the timer for an hour? I tend to get overly involved in little projects then at bedtime find myself half finished with a huge mess surrounding me. With a one hour time limit I had time to tidy up and place the discards in the rubbish bin. One good thing has already come out of this. A coworkers approached me with a hard sell on some MLM marketing scheme for face lotion that is guaranteed to make you look 20 years young. Sorry, Lynn … I’m not buying anything! Have you decluttered areas in your home or office? Do you have any great tips or experiences you could pass along to me as I start this year-long project?